Latex of E.Neriifolia - The latex is collected in steel container by stabbing the stem at various places. Preparation of kshaara of A.aspera- The whole plant (root,stem,leaf & seeds) are burnt at the cemented surface and collected in iron or earthen pot and stirred for 4-5 times at one hour intervals for complete burn of ash.Ash is dissolved in distilled water and filtered. The filtrate is evaporated in steel pot to obtain white material. It is grinded in mixi and sieved with 100 mesh. this powder is ready to use. Rhizome of curcuma longa is grinded and sieved with 100 mesh. The kshar-sutra is prepared on surgical linen no. 20.Cotton swab dipped in latex is rolled on the thread and then put for drying in the cabinet (cabinet equipped with fan,heater and u.v.light).Such coating is done with latex & kshaara .when threads are dried ,loosley bounded kshaara particles should be brushed with cotton swab before next coating to obtain uniform thickness.Kshaar is highly hygroscopic, so kshar coating should be done in dry atmoshphere. After complition of seven kshar coating, three coating of curcuma longa powder is done in the same way.When prepared kshaar-sutra is completely dry,it is sealed in glass tubes with dry silica gel. It can be used for two years. Moistured kshar-sutra should not be used . 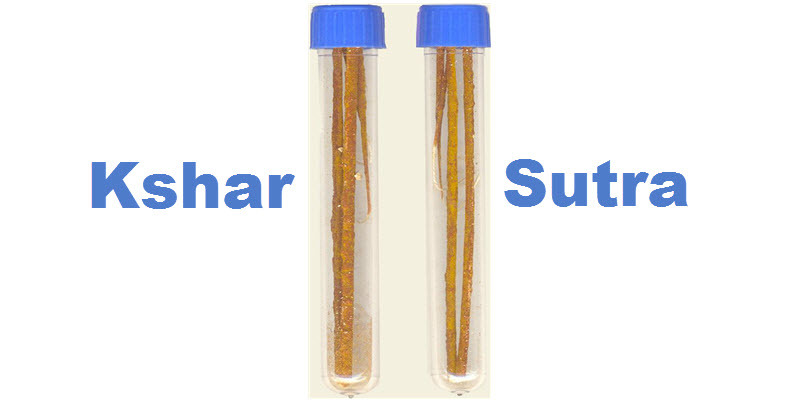 The ph of prepared kshaar-sutra is 9.7 .